Ballantyne House, long time Highland home of The Press and Journal, the former office block on Academy Street, Inverness which is being converted to a Travel Lodge hotel. The funding which will give Academy Street a facelift is part of a £8.6million investment package for heritage-led regeneration projects in Scotland’s seven cities. It is being released through the City Heritage Trust programme, which is administered by Historic Environment Scotland (HES). The £250,000 being allocated to Inverness City Heritage Trust for the years 2018-2020 will be added to their five-year offer (2015-2020) of £1,250,000. The majority of the money is committed to provide partnership funding to the Heritage Lottery Fund (HLF)’s Townscape Heritage Initiative for Academy Street. 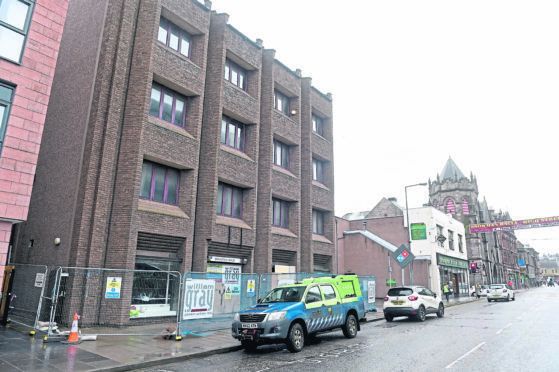 Building owners in run-down Academy Street will be invited to bid for cash to do up their dilapidated properties. Delivered from 2018-2021, the HES funding will allow heritage trusts to direct resources to local heritage-led projects that will create jobs, regenerate buildings and city precincts, provide training opportunities in the sector and lever additional funding from other sources. The Perth and Kinross Heritage Trust has led a project to bring a historic tenement in Perth’s High Street back into use as residential and shop space. Alex Paterson, chief executive of HES, who recently visited Perth to view the successful projects, said: “Through schemes such as City Heritage Trust funding, organisations best placed to understand local needs have the opportunity to not only improve the condition and quality of their local historic environment, but align projects to deliver the best possible outcomes in their communities.